The Pacsafe Anti-Theft RFIDsafe V200 is a compact blocking travel organiser. This pacsafe organizer is roomy, well-organized and has RFID safe that protects enough passports, IDs and credit cards for three people. The RFID blocking liner in the durable nylon exterior does not allow scanners to read the radio frequency tags embedded in credit cards and passports keeping our personal data safe. Lightweight, rugged, water-resistant and the sporty design opens flat for easy access to two currency compartments, 12 credit card slots, a mesh ID holder and a pen holder. It also has a mesh slip pocket that holds up to three passports, and two vertical slots for boarding passes and receipts. One outside zip coin pocket and a zip closure keep contents secure. Made of slashproof and waterproof Dyneema, the wrist strap automatically tightens if someone grabs the organizer. A safety limiter keeps the strap from tightening completely. The Anti-Theft RFID Blocking Travel Organiser 10566100-Black has many exciting features for users of all types. See the Anti-Theft RFID Blocking Travel Organiser 10566100-Black gallery images above for more product views. 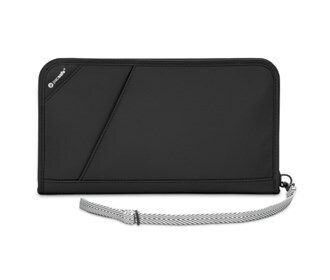 The Anti-Theft RFID Blocking Travel Organiser 10566100-Black is sold as a Brand New Unopened Item.